The internal crisis within PAS, DAP and PKR is now seen to be getting worse when the issues which they argue often overlap in their coalition where each of the component parties have their own opinion and stand. The interesting part is the 'appearance' of Karpal Singh as the main role in every issue which are raised. 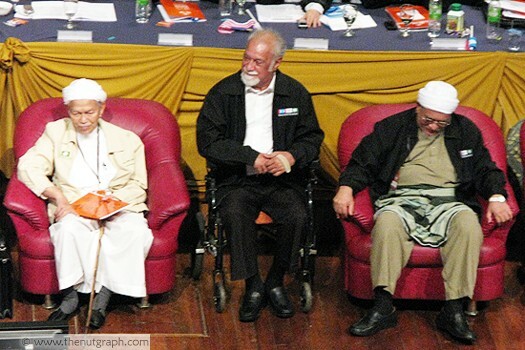 Karpal is like a 'star' in the argument of hudud with Nasharudin Mat Isa. He was fierce in ordering PAS to go back to the original agreement where PAS should stop talking or even dream of implementing hudud and Islamic state. Even though Karpal's stand represents DAP but it seems that Karpal is the only one demanding PAS to put a clear stand in this issue. Kit Siang, Guan Eng and other DAP leaders somehow remained as 'extras'. PAS is also seem to only focus their attack on Karpal alone. PAS even made a statement defending DAP to 'calm' their members by saying that Karpal's statement is a personal statement and DAP basically do not have any problem in 'understanding' PAS's hudud. From there, Karpal kept on being DAP's main actor by filling up frontpages in newspapers with strong statements, revealing the conflict between his party and PAS. Yesterday, Karpal criticized PAS Kedah for selling off 'god's gift', water. Karpal is angered when PAS Kedah decided that Penang should pay for raw water supply which is channelled from Kedah to the state. The reason given by Kedah is that even Perbadanan Bekalan Air Pulau Pinang made a business from the same water. Besides, the maintenance of the natural source include cost which should also be charged to Penang, for which they get to enjoy the use of water. Karpal's consistency in taking care of Penang's interest is seen to be more active to be compared to the Chief Minister of the state himself, Lim Guan Eng, who do not really seem to shine these days. In short, Karpal is the only PR leader who is fast and furious when it comes to handling issues which involve the unity in PR coalition. Like a Chairman of Fatwa Council for PR, Karpal tries his best to ensure that the cooperation in Pakatan Rakyat should go how DAP want it to be. Even in DAP, karpal uses the same approach where he is the 'man of justice'. Karpal is the champion in fighting for 'one candidate, one seat' for the coming GE to ensure that assemblymen should focus on their constituencies. However, Karpal's suggestion has given doubt to even DAP members when Teresa Kok insulted him by saying that Karpal is just an 'old story'. Teresa Kok's actions has raised anger among a few because she is seen to not respect the elders and also a very experienced party Chairman. Due to that, Kota Alam Shah MP, M. Manoharan raised Teresa's failure in her service as an assemblywoman as she holds a lot of 'seats' or posts in the party as well as the state government. Despite that, recently, more and more DAP members are beginning to show their support on Karpal's idea, hence, giving him more popularity. The strategy in focusing on Karpal and to silence all DAP leaders in a way is seen as a measure to reduce the crisis which is happening within Pakatan Rakyat. But, as for Karpal, he would need to be more careful in taking the next step because this could put him in two different positions. One as 'star', and the other is a 'scapegoat'. The scenario is, if PR wins the coming GE13, so the issue of DAP's rejection aghainst hudud should be solved to avoid PAS top leadership from being raged. Even when PAS leaders could still give the excuse that they need majority in parliament, they would need to prove that they are really serious in going against those who do not accept hudud. That is why, Karpal might need to be sacrificed as the only DAP leader who goes against hudud. With that, even if hudud is not implemented, PAS would go back to it's normal stage and DAP would remain safe. As an 'old story', Karpal can simply be 'retired'. Sadly, this would not get him the title of Tun Karpal unlike what was portrayed by Tun Mahathir, because Karpal would not retire as a Prime Minister, but he would only retire as a scape goat, party Chairman.